Everybody has heard of the mighty Inca Empire and the many wonderful ruins they left behind, most people know something about the famous Machu Picchu and the legends surrounding the mysterious Inca Citadel. It is a dream of many travelers to visit Peru and its many treasures. There is so much to see and do in this incredibly diverse country. One of the Inca sites that you should visit in the Cusco region is the Maras and Moray attractions not far from Cusco City. 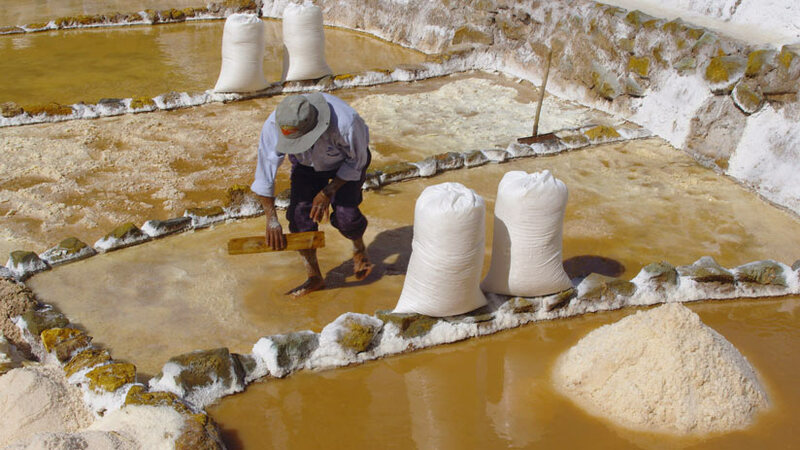 The salt mines in Maras have been active since before the times of the Incas. The site features around three thousand salt wells, some of which are dry and others that are still in use. However, the mines and the surrounding areas feature some of the most stunning man-made and natural beauty you will see anywhere. 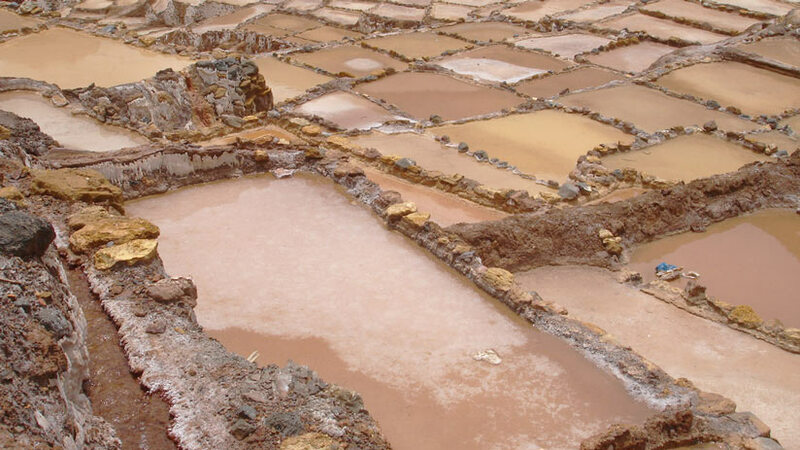 Since pre Inca times, salt has been obtained from Maras. The highly salty water comes from a spring underground. The flow from the springs is directed into a system of channels that runs into the salt ponds. 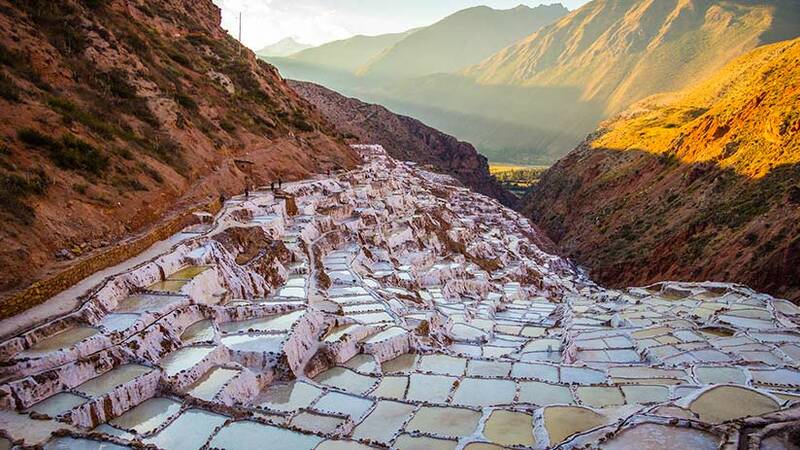 It is thought that the saltpans were originally constructed by the Wari Civilization, which is pre Inca, However the Inca´s saw the opportunity to harvest the salt for themselves and to trade, so the ponds were expanded further up the hillside. Today, families of the local community own the pans; the salt is collected and sold locally in shops and markets nearby. Your first sighting of the saltpans will amaze you, the white saltpans against the green mountains alone is worth the journey. While Maras’s salt flats will astound you with their man-made and natural beauty, Moray is more a testament to the human genius of the Inca´s. 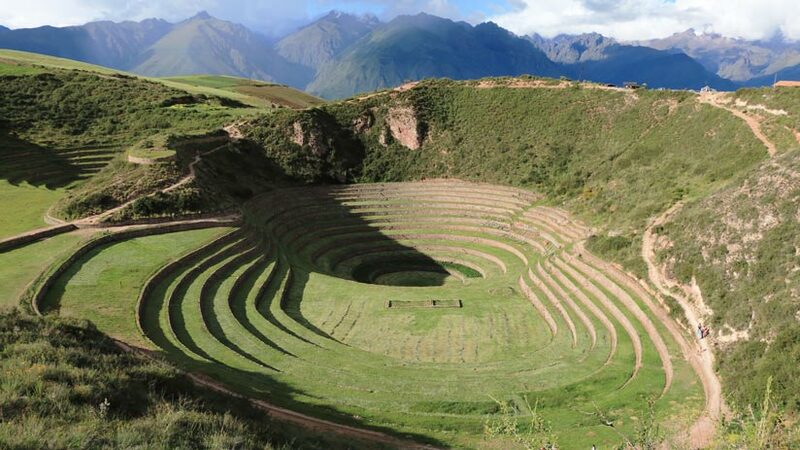 On a visit to Moray, be prepared to be amazed at the incredible terraced platforms covered in lush green grass of the Sacred Valley of the Incas. The site was said to be an open-air area for the investigation and testing of different types of soil and crops. Agriculture was so important to the Inca´s that the regularly conducted investigations into plants and seeds. The main products the Inca´s cultivated were potatoes, coca and corn, which was the basis of their diet. The other aspect of any tour to Moray is the stunning landscape that surrounds the site; the mountains will take your breath away. Plenty of photo opportunities to be had on a tour to Maras and Moray. 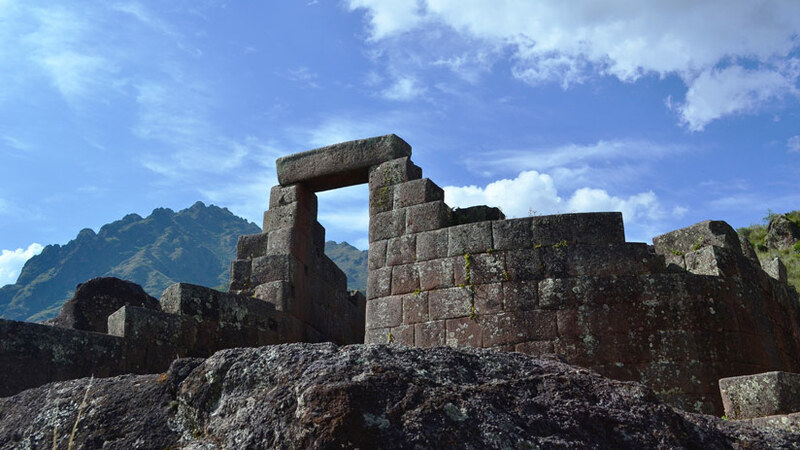 These ruins are different from a tour to the ruins in the Sacred Valley or Machu Picchu as there are not many tourist so you will basically have the sites to yourself, which cannot be bad thing. Also in the area are plenty of adventure activities like zip lining, quad biking, bike riding and also many beautiful walks and hikes to do around this area. When visiting the Cusco area on their Peru Holiday most people visit the Sacred Valley of the Inca´s, here you will find the ruins of Pisaq and Ollantaytambo, these ruins with their interesting history and legends that will fascinate you for hours. The ruins are very popular with the day-trippers from Cusco, with buses filled with tourist making the journey every day. They are worth the visit for the spectacular views and the lessons you will learn. In Pisac apart from the ruins, there is a daily market, which attracts hundreds of tourist every day. The market is a great place to buy presents for the family at home and to get some great photos of the local people who come to the market to sell their hand made treasures. The Sacred Valley is also a great place to spend some time, as the climate is very mild compared to Cusco and the lovely villages cater for tourists with nice hotels that will suit every budget. We cannot forget to mention that on every trip to Peru you must visit one of the Seven Wonders of the World, Machu Picchu located around three hours from Cusco city by train, this magnificent example of Inca architecture will not fail to impress. While you are at Machu Picchu, why not experience some of the many treks around the area, like Huayna Picchu the mountain in front of Machu where you will get spectacular views of the Inca Citadel. Discover the Machu Picchu mystery; you can do so on a private luxury or a ready-made itinerary. When you journey to Peru, do not forget to take the time to discover all the mysteries of all the ancient cultures of Peru, many thousands of years of history that ends today with a mix of people who will welcome you with open arms. But for an interesting day out travel to the Salt pans of Maras and the Inca Terracing at Moray, something interesting to see for all of the family. Peru has so much to offer, it can be hard to know where to start. This is where Machu Travel Peru comes in! Simply complete the form providing as much information about your travel as you like and we’ll get planning for you. Finding the right hotels and experiences for an unforgettable stay in Peru is our speciality!. Please note that our tours depart 365 days a year. Luxury Travel, Travel To Peru cusco, family vacations, history. permalink. The Best Way to See the Nazca Lines: Plane or Tower? Peru Machu Picchu Hike, the Inca Trail | Machu Travel Peru on Why is Machu Picchu considered a wonder of the world? USA Office Address: 348 California St 160, San Francisco, CA 94104.